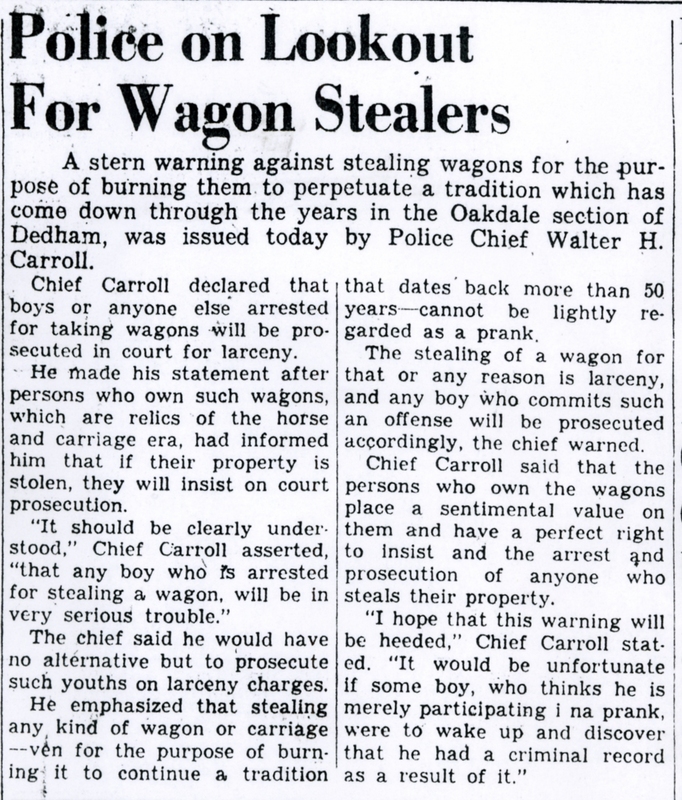 The bylaw was adopted in 1959 in response to the resurrection of a dangerous, unique, and beloved Dedham tradition- the burning of old farm wagons in Oakdale Square on either “the night before” of July 3rd, or the night of the 4th itself. Beginning some time in the early 20th century (my research found the oldest recorded reference to be 1922) thousands of people would gather in the square to witness the event. In the 20’s and 30’s, police and fire officials merely watched and made sure nobody got hurt. The spectacle usually began at midnight when some brave youth would climb the roof of the Good Shepherd Church and ring the bell. The wagons came from local farms in Dedham and surrounding towns. As authentic farm wagons became scarcer, teenagers would make their own and hide them in back yards and garages until the big night. In 1938, no wagons were found or made, so an old outhouse had to do. Usually the fires got so intense the windows of the stores in the square would crack and the tar underneath would melt. The last Oakdale Square burning was in 1963, when revellers threw rocks and full cans of beer at police and firefighters when they arrived on the scene. After that the burnings disappeared for a few years before the tradition was revived in the Manor. After an explosion and the melting a vinyl-sided house in 1990, police chief Dennis Teehan finally put an end to the burnings. I remember hearing about the wagon burnings when I was a kid, but I never witnessed one. Every time I have been out promoting my book, dozens of people have come up to me and shared fond memories of this one-of-a-kind tradition. Maybe you have some more tales to add to the collection? Pass them along, and have a Glorious Fourth! This entry was posted on July 3, 2010 at 7:48 pm and is filed under History/Mystery, Lost Dedham. You can subscribe via RSS 2.0 feed to this post's comments. You can comment below, or link to this permanent URL from your own site. I just wanted to say that I was enjoying this blog and would be interested if you were planning on posting new articles. The Dedham Tales will be back soon! 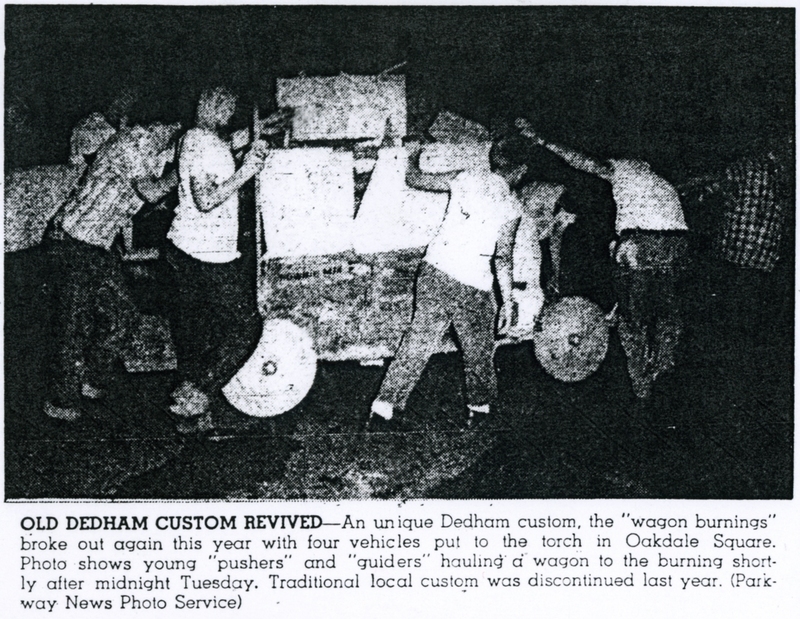 I’ll be posting new tales and some old favorites in honor of Dedham’s 375th! Thanks for your interest and support! 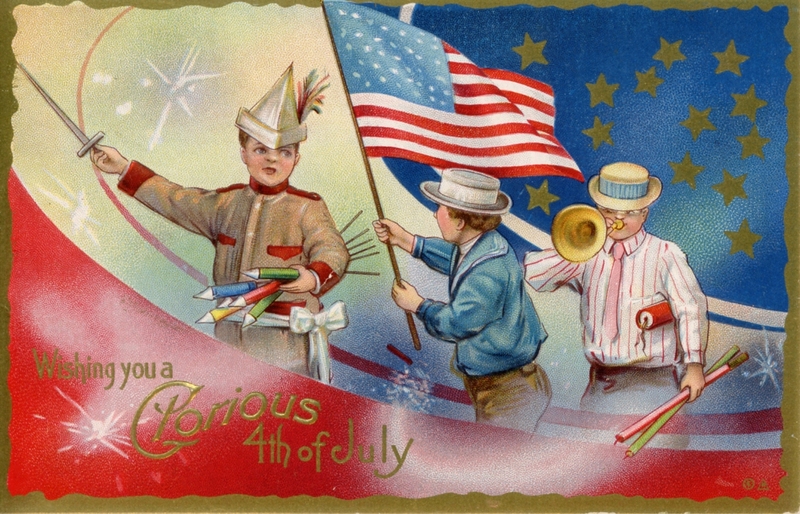 4th of July were very common in the Boston area, going back to the revolution. Most were just piles of old wood, but wagons piled high must have been common as well. It was done on the night of the 3rd – the holiday eve. There’s a great book by Len Travers called “Celebrating the Fourth” which details Independence Day celebrations from the very beginning of our country up through 1826. Lots of references to bonfires and burnings of effigies. Len teaches at UMass Dartmouth and was my boss when I was a pilgrim at Plimoth Plantation. 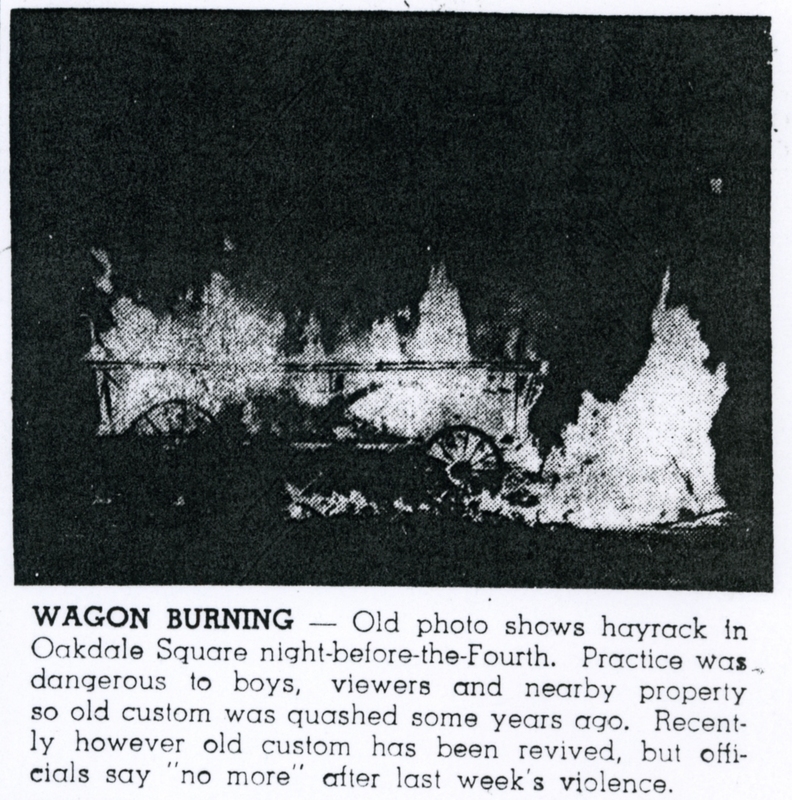 What makes the wagon burnings so unusual is that while many communities had both impromptu and officially sanctioned bonfires, I have not found any other references to that particular custom of stealing farm wagons and alighting them, and that the custom continued so far into the 20th century (1990s). I only witnessed it once, in 1962. It got sort of ugly when the first department tried to reduce or extinguish the fire in Oakdale Square because of damage to adjacent buildings. The big plate glass window in the Oakdale Pharmacy cracked from the heat. Some in the crowd objected to the firemen’s actions, and some bottles and rocks were thrown. Some offenders were rounded up and arrested. The bylaw quoted above followed that incident. I went off to college and did not ever know how it all ended, whether there were more burnings after the one in 1962. I was at the 1963 wagon burn and watched it from my friends front porch just off the square. The picture of the boys pushing and guiding the wagon was taken by my father (Frank Van Pelt), owner of Parkway Photo Service and I am the boy at the back in the plaid shirt. The wagon in the picture was “manufactured” by us and not “acquired” from any outside source. I was on the front porch of the first house from the square and watched the wagons coming into the square after the church bell started ringing that was in 1963,my last time.I believe the next year it was stopped for good.